Customers often approach Intrim to have their rotten or thickened and bubbled skirting replaced with the company’s mouldings. These problems occur mainly because of MDF mouldings having absorbed water. Intrim ran a few tests to assess the effects of water on raw moisture resistant MDF over 24 hours and the results were quite shocking. The rate of water absorption was much faster than anticipated as you can observe on this time lapse video. While a flooded floor is a rare occurrence, floors and skirting boards are constantly exposed to water from various sources. For instance, water may run under your skirting boards from your mop or steamer, or get splashed on the floor in the bathroom. Over the course of a year, the skirting can get exposed to a lot of water; when absorbed, the material begins to rot and come apart. Though paint will protect your MDF and significantly reduce moisture absorption, this protection needs to extend to all surfaces, including the ones not visible to you. 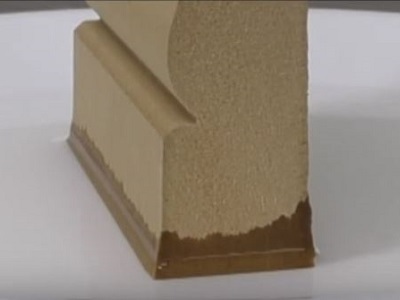 Intrim always recommends having your MDF mouldings primed to protect all surfaces from water absorption and humidity. Alternatively, select FJ pine timber for the ultimate protection against moisture damage to your mouldings.